Fantastic Fun day with Ross-County coaching for over 5's- certificate each child, Zumba dancing for children with visit form Peppa Pig and Fireman Sam, Zumba dancing for adults, Mini assualt course,Story/music workshop, family drumfun lead by Steve sharpe and guests peppa pig and fireman Sam shall be joining in the fun with the children - perfect opportunity for photos with kids favourite characters, face painting, bubbles the ...clown, bouncy castles/slides, cafe, barbecue, stalls, raffle. Football, zumba or family drumfun with peppa and sam all need to be booked before hand as limited numbers and places going quick so please ring nicki on 01997 421369 to book. Under 2's and adults go free and very reasonable prices! THERE IS NO ENTRANCE FEE FOR THE EVENT! We had the mascots last night for a kids group and they went mad for them....they are fantastic! PM me if preffered and should also be advertised in Ross-Shire journal next week! 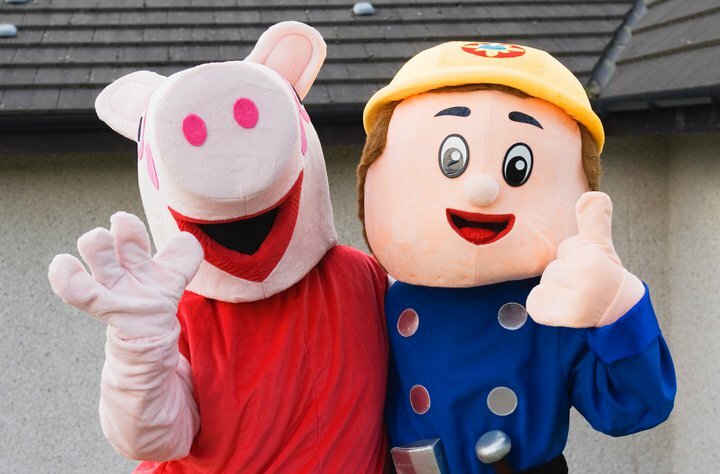 3.30pm - Short parade outside (weather permitting) with Steve, Peppa, Sam and families to end the day! UNDER 2'S AND ADULTS GO FREE! FAMILY TICKET AVAILABLE ON DAY IF PREFFERED. BOOK NOW AND PAY ON THE DAY! PROCEEDS OF CHILDRENS ACTIVITIES/CAFE/BARBECUE/RAFFLE ARE ALL GOING TO SOME LOCAL GROUPS AND OTHER CHARITIES SUCH AS HELP FOR HEROS, HOSPICE AND MOUNTAIN RESCUE!